Why's a ship more likely to be torpedoed if it turns out, rather than in? I read about other benefits to turning into torpedoes; if you turn away, you may oversteer while dodging torpedoes that are chasing you from behind and you may fail to dodge IJN CV torpedoes that converge. But I ask only about the question in the title. The other reason is that if you turn out, your odds of taking more torpedoes than you would if you turned in are pretty high. Let's take this situation. For a torpedo to hit you, it needs to occupy the same X and Y-coordinates as you[r] ship. Staying broadside means that you maximise your length along the Y-axis, so many torpedoes can hit you at once. 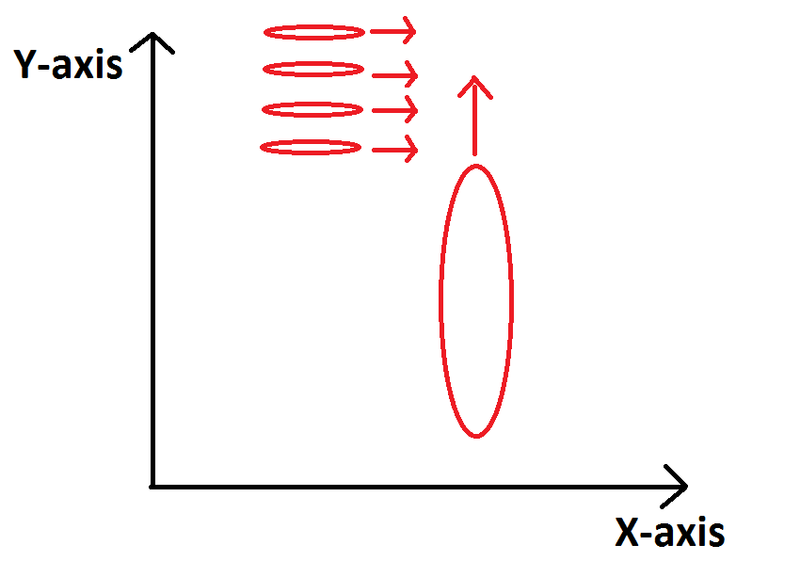 You want to dodge left or right to minimise your profile along the Y-axis, decreasing the chance that a torpedo will intersect you along that axis. If you steer away from the torpedoes, you move into the same X-direction as the torpedoes. 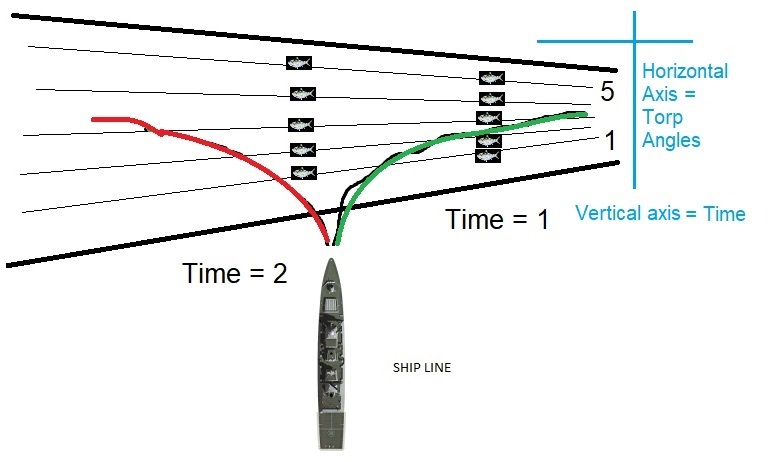 This means that you spend a very long time on the same X coordinates as the torps, and therefore there is a very long time in which the torpedoes can hit you. In the worst case scenario, you can get hit by every single torpedo in a salvo by catching them one after the other, because you spend so much time on the same height as the torpedoes. If you steer into the torpedoes, you minimise the time in which you occupy the same X-coordinates as the torps, therefore there is only a very short time at which they can hit you. I still can't grok why turning into torpedoes is necessarily safer. See the pictures modified by me, in ian9167's comment beneath. If I turn left but choose 'Stop' as my speed, wouldn't only #1 hit? I might've slowed enough that #2 (diverging as time passes) will pass ahead. If I turn right, I must pick 'Full' as my speed (or else my ship will sit broadside and be torpedoed by 1 and 2). But then wouldn't both 1 and 2 hit me? As you turn away, you increase the distance to the enemy torps, while still travelling into the "danger zone". Thus giving them more time to travel and hit you as shown by my next level paint illustration. Go right and get hit by 2. Go left get hit by 3. Equally however you can outrun slow torps by slightly turning out of them - it depends on the situation! But pretty much always turn into carrier torps. If you turn towards (the right/green path), the third torpedo is more likely to miss behind you. By the time you finish your turn and end up in its line, it will already be between the two paths. If you turn away (the left/red path), the torpedo ends up in the same position, but now it's directly behind you and still a threat. In my experience you're unlikely to dodge the #2 torpedo by braking, regardless of your turn, but if you're able to do so the right-hand path offers you better odds. This is because the #2 torpedo will still be closer to the #1 torpedo at that point. Turning away prolongs the encounter, which makes it diverge more, which makes it more likely that you can't turn tightly enough to avoid it. There are also strategic and tactical considerations. Generally speaking, it's better to be facing your enemy and moving towards the fight than facing away from them and moving out of the fight. Keeping the enemy in your front quarter is a better option for most ships' gun layouts and makes it easier to maneuver while keeping track of them. Strategically, if you turn away you're likely to have to keep moving away for a considerable time (especially if they fire another round of torps) which means you're not contributing as much to the overall fight. Not the answer you're looking for? Browse other questions tagged world-of-warships or ask your own question.